Usman Siddique, a UK based pro poker player won the prestigious UKIPT Season#6 at Hippodrome Casino in London and collected the first prize of amount £84,100. This was a great game to which Usman did very well. The chip leader of the Day 2 played very well till the end of the game and claimed the championship title. 10 Players were remained in the business to win the title on the final day of the game. After seven long hours of play Usman Siddique becomes the championship title winner. David Gassian of France was at second position and took home £51,930 as winning prize. Anatolis Jevtejev of Lithuania hit the rail to tenth position playing against David Gassian, who picked up kings in opening moment. The next man to go was Jack Hardcastle (ninth). Gassian Used pocket rings to eliminate him to ninth place. Final Eight Players were Usman Siddique, David Gassian, Joe Hindry, Warren Russell, Daniel Harwood, Jack Salter, Morten Halvorsen and David Docherty. The official final table kicked off when elimination took place and it was of David Docherty (second timer of UKIPT final table). He completed his journey at eight position playing against Jack Salter’s raise $8,731. Next one to go was Norwegian Morten Halvorsen, who made £12,780 from the final table being at seventh position. Jack Salter, a PokerStar Player and qualifier from United Kingdom couldn’t be able to move further than sixth position and collected £17,550 as prize money. 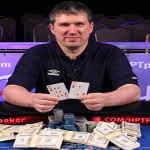 Daniel Harwood of United Kingdom made £22,540 from the table being at fifth position. Warren Russell, a Canadian and Chip leader of Day 2 was out of the game to fourth place and collected the winning prize of amount £28,450. Joe Hindry, another UK professional player got out at third position with total winning share of amount £37,110. Against Hindry’s ten-nine, Siddique called with ace-five. Heads up was among Usman Siddique of UK and David Gassian of France. Siddique was having great card combinations than Gassian and finally won the championship title along with total £84,100.